Violets. What does that word conjure up? Violet candies, old fashioned perfume or the actual flowers, pretty and delicate with downy heart shaped leaves. But violets are much more than that. For centuries they have been good medicine. Ancient Athenians used them to “moderate anger, procure sleep and strengthen the heart”. The Britons used them as a cosmetic and the Celts recommended steeping the flowers in goat’s milk to increase a woman’s beauty. 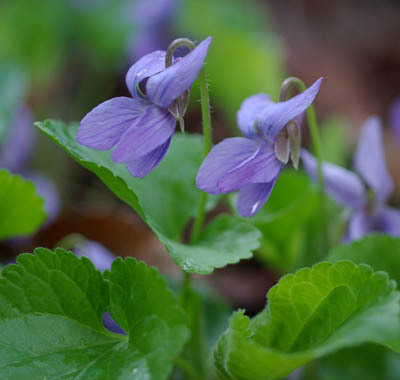 Nicholas Culpepper, a 17th century herbalist, recommends violets for hangovers as well as diseases of the lungs and as a poultice for swelling and pain. Modern herbalists use the leaves and flowers for upper respiratory problems, urinary infections, and skin eruptions as well as part of a long term approach to rheumatism and as a component of cancer treatment. I used to love candied violets. They seemed like jewels or maybe faerie food. I had no idea there was such power in the tiny plant. It’s this hidden power that is one of the most intriguing parts of the study of herbalism. One can imagine roots being medicinal, they’re strong, tough and durable. But flowers seem so ethereal, just a bit of beauty that is here and then gone in a short time. But many blooms are mighty, filled with healing power. Violets are coming up now in the spring. Their flowers will be gone by mid May. If you see one, inhale the fragrance and let some of the healing power in. Gather 1 cup of unsprayed violet blossoms, rinse them and place into a 1 pint mason jar. Pour in 1 cup boiling water. Cover and let steep for 24 hours. Strain out the blossoms, pressing on them to get all the liquid you can. Place the violet liquid into a saucepan and add 1 to 1.5 cups of sugar (depending on how sweet you want it). cap, and store in the refrigerator. You can add the syrup to soda water or use it in a cocktail or just have it by the spoonful.